When you first got the keys to that vacation timeshare in the Florida Keys, it was probably hard to imagine there’d ever come a day you wouldn’t spring out of bed excited to zip up your wetsuit and zip down to the shore. But it happens to the best and the most bubble-blowing among us – we fall into a diving rut. 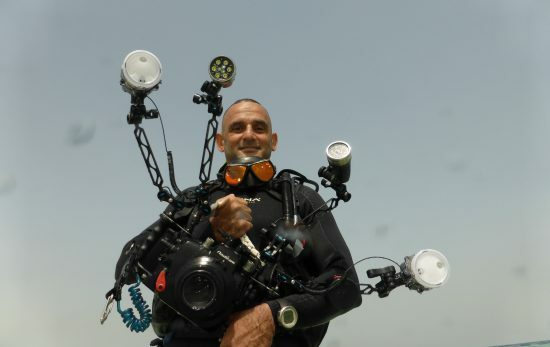 This year, I came full circle by returning to Koh Tao, Thailand, the island where I first earned my Open Water certification, and years later went on work as an underwater videographer – basically, an island where I’ve logged more underwater hours than I can count. I wasn’t sure what the reefs surrounding this familiar old island had left for me. But six months and three shiny new certification cards later, I was more enamored with my first underwater love than ever. 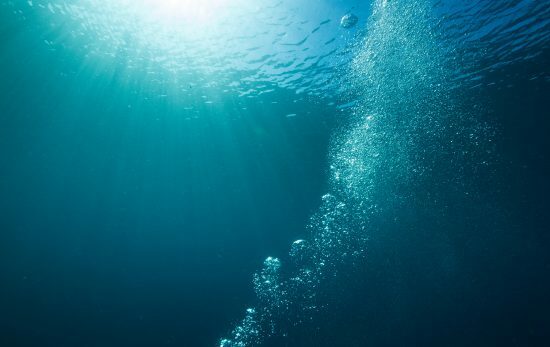 Read on for a list of reasons divers might start to experience a bout of aquatic apathy, and how a continuing education course might just be the cure. Maybe you have a local dive site you return to over and over. Maybe your family shares a condo next to a now-comfortable body of water. Maybe you’re in a tropical vacation routine that you just can’t quit. 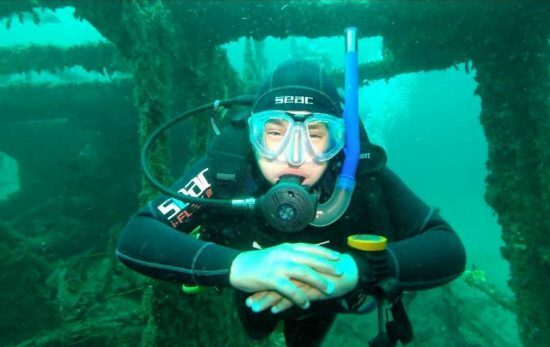 Continuing education can be the solution to spicing up a familiar dive site. There are no waters in the world I know better than the shores of Koh Tao, and while I never lose sight of how grateful I am to live seaside, it can be tough to keep enthusiasm levels up once you know every curve of the coral. So when I saw my friends in the diving community getting excited about sidemount, I jumped at the chance to try something new. 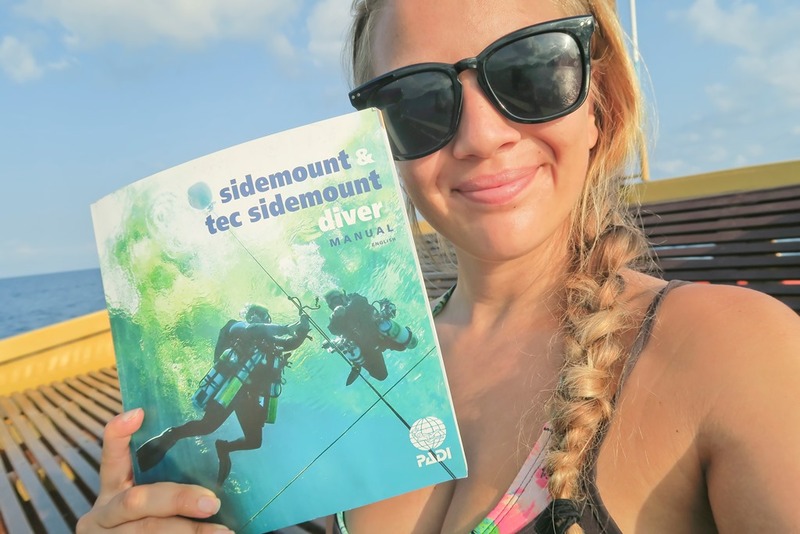 I enrolled in the PADI Sidemount Diver Specialty with Sairee Cottage, and over the next three days and three dives learned the pros and cons, and ins and outs of a new equipment configuration, all while entertaining the idea that someday I might stick my toe in the world of tec. 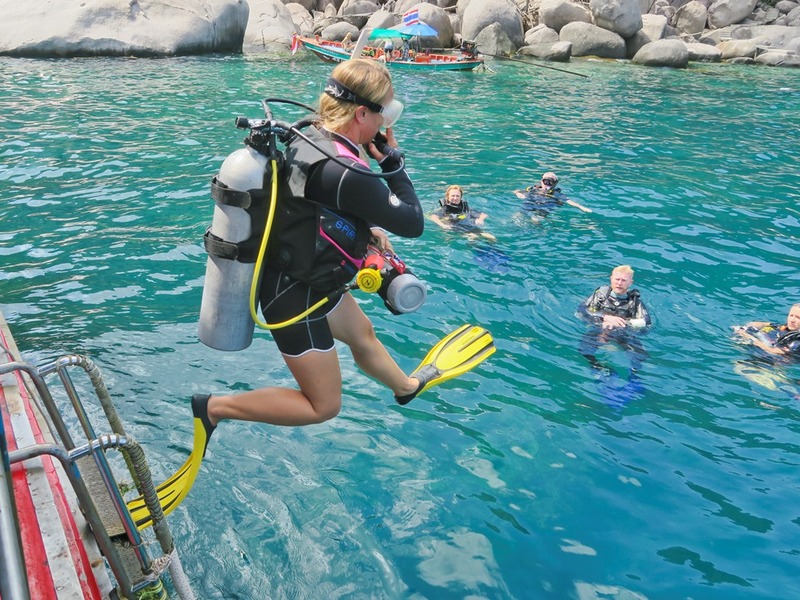 While I enjoyed the benefits of increased dive time, a setup perfect for my petite stature, and, let’s face it, looking spectacularly cool underwater, more than anything I enjoyed waking up as excited to go diving in Koh Tao as I had been for my Open Water. I might have been using my same old mask, but it felt like I was seeing Koh Tao through new eyes – and of course, with two tanks. You’re packed, you’ve saved, you’ve planned, and on your way out the door to your dream vacation you check the forecast to see… nothing but rain. Don’t fret. Over the years I’ve gotten very comfortable in my fun diving routine, which revolves almost entirely around my love of underwater photography. When a long run of bad weather squashed my desire to set up my housing while back in Thailand, I took the opportunity to enroll in a course that was perfectly aligned with my aperture addiction. “There’s no better scenario to learn to be self reliant in than low visibility and a bit of a current,” says PADI Course Director Gaz Lyden, who taught me my Self Reliant Diver distinctive specialty course at Master Divers on Koh Tao. Normally I’d be cranky without my camera and underwhelmed by overcast skies, but in this case it was all par for the course – literally. For once, I didn’t worry about backscatter as being a self-reliant student meant focusing on the benefits of equipment redundancy and running through emergency skill circuits instead. The course is perfect for photographers who may become temporarily isolated from their dive buddy in pursuit of the perfect shot, and so despite not depressing a shutter and not seeing a ray of sunshine for the entirety of our three dives, I emerged a stronger diver and more competent underwater photographer. 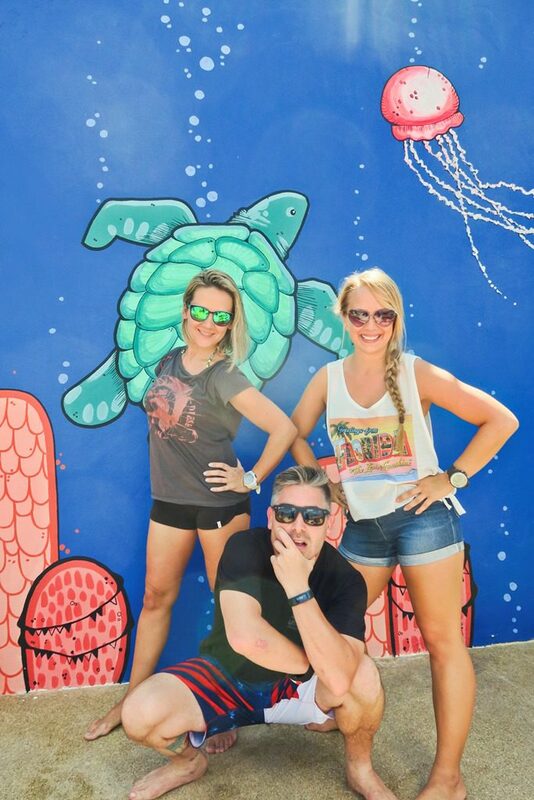 Toss out your expectations of getting a tan on the surface interval and getting crystal clear snaps under the sea and embrace coming home with an even more valuable souvenir – a new skill set and a deeper understanding of the world of diving. For seasoned divers and especially PADI professionals, there may come a moment when you feel that your education is over and you’ve learned all you need to know about the mysteries of diving and the deep. When I completed my PADI Divemaster with no intentions to move forward to my IDC, I know I assumed my certification card collecting days were over. I was wrong. After hearing so many of my dive friends rave about the longer no-decompression limits and lack of fatigue from diving with Enriched Air, I knew PADI’s most popular specialty at Ban’s Dive Resort was worth pulling my notebook out of retirement for. Though technically Enriched Air can be taught as a “dry course,” my instructor Chris Pearson and I chose to seal in the extensive knowledge reviews we completed with two fun boat dives. I’m thrilled to now have the option to reach for a green and yellow tank, but more importantly I feel more confident than I ever have before about my grasp of diving theory. It was a reminder that my dive education will never be over. “For instructors who have been in teacher mode with diving for decades, it’s really something to see them become a student again,” said my sidemount guru Gordan MacBride. “I think it’s something they take back to their own classrooms after.” There’s nothing like putting yourself back in the fins of a student to remind you to teach with compassion. The bottom line? You’re never too old, too experienced, or too educated to keep learning. 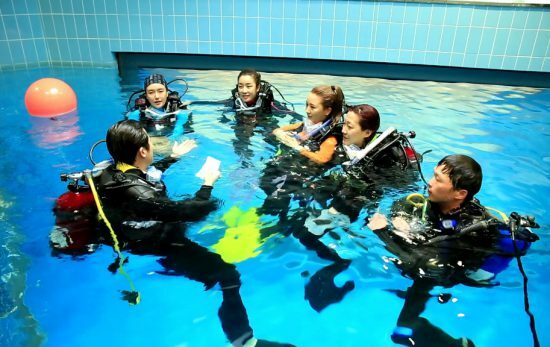 On the other hand, some divers may complete a basic course and then lose focus on pursuing a hobby they truly enjoyed. Sound familiar? Continuing education can be just the inspiration you might need to get back in the water! 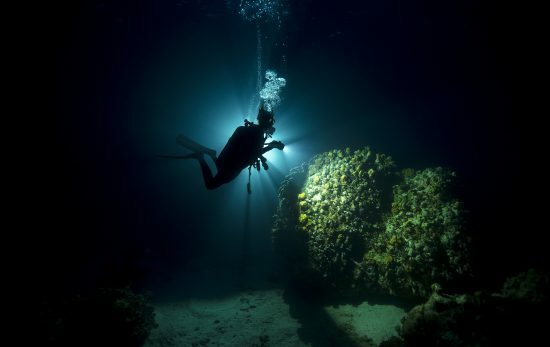 For a new diver with just an Open Water certification under their weight belt, specialty courses like PADI Wreck Diver and PADI Night Diver can open whole new underwater worlds. What continuing education courses have you learned and loved? Let us know in the comments!